We love the classic flavor combination of dark chocolate and peppermint, especially in our hot chocolate. There's nothing quite like warm, rich chocolate and bold mint to brighten your day. So why not start off your day on the right foot? For the ultimate breakfast-dessert mashup, this dish takes all of the flavors of a peppermint hot chocolate and applies them to tender and moist pancakes. The batter is forgivingly simple, with cocoa powder making the pancakes a deep brown. Chocolate sauce stands in for syrup, and chocolate chips, mini marshmallows, and crushed peppermint candy take the whole dish to the next level. Keep the pancakes in a low oven or under a thick kitchen towel as you make them to keep them warm. If you don't have chocolate sauce handy, make your own by melting 1/2 cup semi-sweet chocolate chips and adding warm milk or cream until you reach the desired consistency. 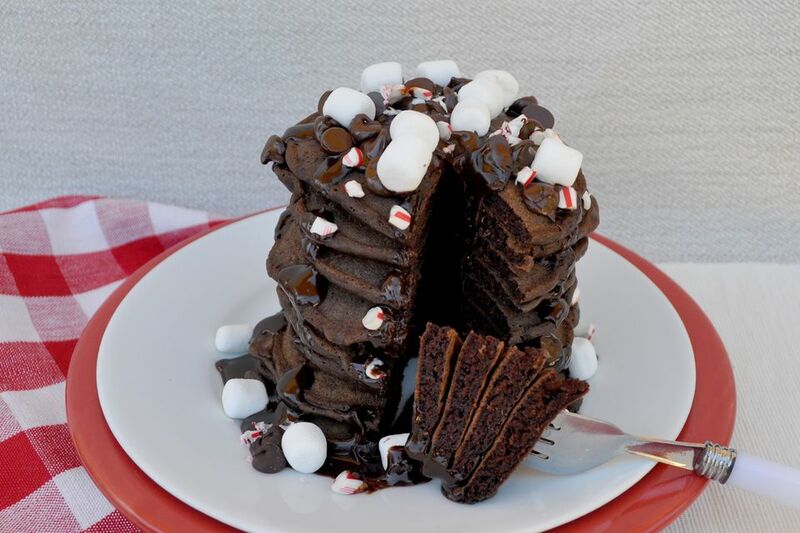 Peppermint Hot Chocolate Pancakes also make a quick and tasty dessert if you don't have the time or energy to make a whole chocolate cake. It's easy to make just enough without lots of leftovers to temp you the next day! In a small mixing bowl, combine the flour, cocoa powder, sugar, baking soda, and salt. Mix well. In a medium mixing bowl, combine the milk, egg, canola oil, and peppermint extract (if using). Mix well. Add the dry ingredients to the wet ingredients and mix just until combined. The mixture will be lumpy. Heat a large skillet over medium heat. Once hot, add 1 teaspoon of the butter and let melt, coating the pan. Add about 1/4 cup of batter to form a pancake. Repeat 1 to 3 more times, depending on the size of the skillet, and space the pancakes evenly apart without touching. Let cook for 1 to 2 minutes, or until the edges are setting up and bubbles have formed on the top of the pancake and are beginning to pop. Flip and cook another 1 to 2 minutes, or until cooked through. Keep pancakes warm under a kitchen towel or in a low heat oven. Add another teaspoon of butter and repeat until all of the batter is cooked. To serve, top each pile of warm pancakes with chocolate sauce, chocolate chips, mini marshmallows, and peppermint candy.